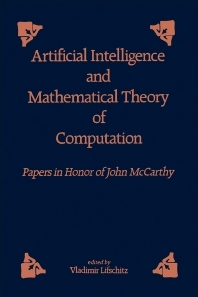 Artificial and Mathematical Theory of Computation is a collection of papers that discusses the technical, historical, and philosophical problems related to artificial intelligence and the mathematical theory of computation. Papers cover the logical approach to artificial intelligence; knowledge representation and common sense reasoning; automated deduction; logic programming; nonmonotonic reasoning and circumscription. One paper suggests that the design of parallel programming languages will invariably become more sophisticated as human skill in programming and software developments improves to attain faster running programs. An example of metaprogramming to systems concerns the design and control of operations of factory devices, such as robots and numerically controlled machine tools. Metaprogramming involves two design aspects: that of the activity of a single device and that of the interaction with other devices. One paper cites the application of artificial intelligence pertaining to the project "proof checker for first-order logic" at the Stanford Artificial Intelligence Laboratory. Another paper explains why the bisection algorithm widely used in computer science does not work. This book can prove valuable to engineers and researchers of electrical, computer, and mechanical engineering, as well as, for computer programmers and designers of industrial processes.